Powers/Abilities: Prometheus possesses the conventional attributes of an Olympian god. Like all Olympians he is immortal: he has not aged since reaching adulthood and cannot die by any conventional means. He is superhumanly strong (at least Class 30), immune to all Earthly diseases and is resistant to conventional injury. If wounded, his godly life force would enable him to recover with superhuman speed. (Indeed, Prometheus' liver would regenerate itself after being eaten daily by an eagle during the Titan's millenia-long imprisonment on Mt. Caucusus). It would take an injury of such magnitude that it dispersed a major portion of his bodily molecules to cause him physical death. Even then, it may be possible for a god of equal power to revive him. Prometheus is precognitive, able to mentally foresee events in alternate futures and can teleport between dimensions such as from Olympus to Earth. Prometheus has also demonstrated magical healing powers over others but his abilities are not as developed as the sun-god Apollo's. History: (Greek myth)- Prometheus is one of the gods known as the Titans, the race of superhuman immortals that preceded the rule of Zeus and the other Olympian gods in the pocket dimension called Olympus. Prometheus is the son of the Titan-god of order Iapetus and the goddess-nymph Clymene and is one of four children born to the pair. Prometheus siblings included Atlas, Menoetius and Epimetheus, all of them Titans. When the rule of Prometheus' uncle Cronus as supreme monarch of the gods was challenged by his son Zeus and Cronus' other offspring by his wife, the Titaness Rhea, Iapetus and the Titans revolted against the Olympian gods, joined by his sons Menoetius and Atlas, while Prometheus and Epimetheus chose to side with Zeus at the advice of the Titaness Themis, goddess of order and prophecy. Themis foresaw that the Titans could not win over the Olympians and allied herself with Zeus and his faction. The war between both sides of the gods endured for ten years. Menoetius was killed by Zeus' lightning bolts during the revolt and it is said that Atlas was given the weight of the world to bear on his shoulders while most of the other male Titans were consigned to Tartarus. (Obviously the accounts of Atlas' punishment is erroneous and was probably a misinterpretation of the true account on the part of the Olympian gods' human worshippers in Greece and later Rome). After defeating the Titans, Prometheus and Epimetheus took an interest in mankind and became joint rulers in Phthia. Unlike most of the other gods who saw Earth humans as pawns in their games and chose to interfere in human affairs, Prometheus always had a great affection for humanity and even considered himself a friend to humans. After the end of the Hyborian Age (circa 9,500 BC), Zeus sought worshippers on Earth, in the land now known as Greece. Prometheus learned from Athena (Zeus' daughter) architecture, mathematics, navigation, metallurgy, and other practical arts. Prometheus taught many of his subjects these skills and disciplines in order to civilize savage man, but Zeus grew concerned at this. Eventually, Zeus decided to reign in mankind for its hubris, and ordered Prometheus to stop helping man advance so quickly in civilization. Prometheus eventually went too far in guiding the destiny of humanity and showed them the secret to fire in cooking and working from it, an act which broke Zeus's patience. Apparently one night, when Zeus was away, Prometheus crept to Olympus along a secret path and stole the gods's precious fire, hiding it in a hollow reed, which he concealed in his cloak. When Zeus returned to Olympus he was highly infuriated. (Evidently, the fire represented the life-force of the Olympian gods and should it be snuffed out, it would end up banishing the gods to a limbo-like existence. Since Prometheus stole a portion of the mystical fire, it has been regarded to this day as the Promethean Flame). Zeus then angrily chose to punish Prometheus for his rebelliousness, and ordered his son Hephaestus the fire-god, to make chains of great durability that would imprison the Titan. Prometheus was bound and then chained by the sibling gods Kratos and Bia under Zeus' strict orders to a pillar in the Caucasian Mountains where he remained for several thousands of years. To add to this punishment, Zeus sent an eagle to peck at the liver of Prometheus everyday, leaving only at nightfall. At night, while Prometheus felt additional pain from exposure, the Titan's liver grew back, prolonging his suffering. Prior to his imprisonment in the Caucasian Mountains, Prometheus once had a love affair with a mortal woman by the name of Pronoia and by her had a son named Deucalion. Deucalion then married Pyrrha, the human daughter of Epimetheus. Through the families begat by Deucalion and Pyrrha, Prometheus became the ancestor of several Greek mortals and heroes who were known to have dealings with the Olympian gods throughout the ages. Among his many human descendants are the warrior woman Atalanta, Sisyphus who was punished in Tartarus by the god Pluto, the hero Bellerophon who slew the monster called the Chimaera, and Jason, who was King of Corinth and leader of the Argonauts and a friend to Hercules in ancient Greece. Allegedly Zeus vowed to destroy humanity by creating a flood to destroy mankind, but Prometheus revealed this contingency to his son and successor, Deucalion, who probably used inspiration from the earlier legend of Utnapishtim to survive the flood by containing his family and animals in an ark. After the flood, Deucalion's family became ancestors of the royal families of Thessaly (see comments--It might be noted that this alleged flood was by no means absolute). Danaus from Libya arrived and his family inherited Argos. Cadmus leading an army of Phoenicians in search of his sister Europa founded Thebes. Cecrops the god-king of Athens returned under the name Erichthonius and replaced his successors. Descendants of the goddess Selene ruled regions of Calydon. However, such a flood remains hard to reconcile with other reported cataclysms. Zeus once offered to free Prometheus if he would reveal the secret of the prophecy that told of the dethroning of Zeus one day, however, Prometheus refused. The stepmother of Prometheus, the Titan-goddess Themis, also had the gift of precognition and informed Zeus of the prophecy. The prophecy told that the potential offspring of Zeus and the goddess Thetis would be more powerful than his father and would supplant Zeus as ruler of the gods as Zeus himself had done to his father Cronus who had done the same to his father Ouranos. Due to this revelation Zeus married Thetis to the mortal Peleus by whom she became the mother of the demigod Achilles, and the wedding of the two was the initial starting point of a competition among the goddesses Aphrodite, Athena, and Hera which ultimately led to the Trojan War. Six or seven generations later, Zeus had a son named Hercules (then called Heracles) by the Mycenean Princess Alcmene. A grandson of Perseus, Hercules, needing to fulfill his famous Twelve Labors, traveled to the Caucasus mountains while separated from the Argonauts while on his way to the land of the Amazons and came across Prometheus. He slew the eagle that tortured him and Prometheus became his life long friend and advisor. At first Zeus objected, but he eventually allowed Prometheus his freedom after deciding his punishment was complete. Prometheus foresaw this event many centuries before when he advised the mortal Io about her destiny and realized that Hercules, a descendant of Io, would one day be his rescuer. Prometheus deeply appreciated Hercules' help, and resolved to repay him someday. (Avengers I#282) - In the modern era, Hercules was badly injured in a battle with the Masters of Evil after he had been drugged by the villain Black Mamba, which had impaired the demi-god's judgement and caused him to foolishly charge into battle. Hercules suffered serious brain damage, causing him to constantly babble about the Avengers. Zeus, unaware that the Masters of Evil were responsible, wrongly concluded that the Avengers had attacked Hercules. Neptune, under orders from Zeus, abducted Namor and brought him to Hades. Neptune turned Namor over to Cerberus, but the Sub-Mariner battered Cerberus and escaped. Namor was badly burned trying to swim in the flaming river Phlegethon and barely made it to shore. Prometheus healed Namor's wounds and directed him to Fortress Tartarus, where the other Avengers were being held in the Garrison of the Accursed. (Avengers I#283) - The Avengers escaped Hades and made their way to Olympus. Prometheus spoke to them while they were in the woods. He showed them with a scyring pool a vision of Zeus and Apollo in Hercules' room as Hercules lay in a coma. The Avengers concluded that they had to try to persuade one of the other Olympian gods to come to their defense. Venus aided them eventually, getting them into Hercules room, where Dr. Druid tried to use his mental powers to cure Hercules' brain damage. However, Zeus interrupted them, blasting them. Miles away, Prometheus realized that "the final battle between gods and man must now begin". (Avengers I#284) - As Thor, Namor, She-Hulk, and Captain Marvel continued the battle with Zeus, Hermes removed the badly injured Doctor Druid and Captain America. Hermes then went to Hercules' room and made off with him. In a cavern in the outlying hills of Olympus, Hermes arrived with Hercules, meeting up with Prometheus and Hera. Hera had decided to go against Zeus' rampage and ally herself with Prometheus. Prometheus tended to Captain America and Dr. Druid's injuries, then worked on reviving Hercules. Neither Dr. Druid nor Apollo had succeeded in doing so, but Prometheus tried a desperate measure. Using Hermes' caduceus, Prometheus called on Gaea for the power to revive Hercules. Meanwhile, Thor and Captain Marvel continued to battle Zeus. Prometheus channeled some of his life force into Hercules. However, due to Hercules' brain damage, Prometheus had to be careful in how he went about administering this process. When Captain Marvel attempted to attack Zeus with a major energy blast, the blinding light she gave off distracted Prometheus. This resulted in Hercules reviving in a state of extreme paranoia, and he attacked Prometheus. 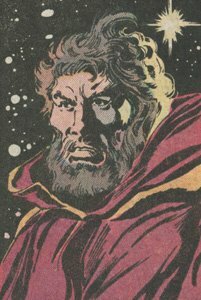 (Avengers I#285) - Dr. Druid used his mental powers to awaken in Hercules the memories of how he had been set up, and the Masters of Evil who had bludgeoned him. Hercules then saw Zeus, who had only managed to subdue the remaining Avengers after a concerted battle, grabbing the prostrate Thor by the throat. Hercules, behind Zeus, told Zeus to unhand Thor, but Zeus, in the heat of rage, did not recognize his son's voice. Zeus attacked Hercules, but then the Avengers restrained him and showed him whom he had attacked. Prometheus, carrying Captain America with Dr. Druid, arrived on the scene. Prometheus revealed that the strain of reviving Hercules had caused him to show signs of age, with much of his hair turning white. Prometheus then attended a reception with the Avengers. At the amphitheater of Olympus, in a gathering attended by everyone from Neptune to the Muses, Zeus prohibited any Olympian from traveling to Earth. Later, on the edge of the dimensional abyss surrounding Olympus, Prometheus talked with the Avengers warning them "There be many serious challenges awaiting you on your world. In the days to come, mankind will have need of heroes....and you will be sorely tested!". He then teleported the Avengers to Earth. Comments: Adapted for the mainstream Marvel Universe by Roger Stern and John Buscema. Marvel Classic Comics#18 (1977) features an adaption of the Odyssey. As in the original story, Odysseus descends into Hades with his crew. He sees Sisyphus rolling his rock and also sees Prometheus getting his liver torn out by a vulture. This presents a problem, since long before Odysseus was born, Prometheus was freed by Hercules. Not only that, but Prometheus was never imprisoned in Hades, but in the Caucasians. I suspect the writer of Marvel Classic Comics#18 meant to refer to Tityus, a giant who was killed by Apollo and Demeter who was sent to Hades and punished by having his liver torn out by a vulture similar to the way Prometheus was. Prometheus and his brothers were sometimes regarded as the son of The Titan Eurymedon and Clymene. It is widely accepted that they were the offspring of Iapetus and Clymene. In the myths, Prometheus was punished for giving man the secret of fire. In an Earth-616 Marvel Universe context, I am not sure that would really suffice. Something that might be more feasible for Earth-616 has to do with the Hyborian Era. The key concept of the Hyborian Era is that a period of advanced civilization existed which was latter lost when a cataclysm occurred around 9,500 BC which forced mankind to revert to savagery to survive. If one considers the fact that the Handbook explicitly stated that the worship of the Olympian gods began after the end of the Hyborian Age, I would speculate that since many of the advances of the Hyborian Age (oil lamps, hinges, forging of steel, iceskating, hand-pumps, hinges, etc.) were lost in the years subsequent to the cataclysm that destroyed that part of history, Prometheus probably helped man rediscover some of these lost disciplines. Something that struck as a little bit strange in placing Zeus' having been raised "in the land that later became Greece"; since the Handbook states that the Olympian Gods started receiving worship from humans after the end of the Hyborian Era, that would seem to imply that the birth of Zeus, the war with the Titans, etc. took place during the Hyborian Era. However, during the Hyborian Age, the landmasses of Earth were very different, since fewer continents existed as what became Africa, Asia, and Europe was all one landmass. Hence, it is a little hard to geographically equate Hyborian Era countries with the nations that they became after the end of the Hyborian Age. So coming up with what the Hyborian equivalent of Greece was remains a tricky task. I would guess that the land where Zeus was raised was Argos or Corinthia, two Hyborian Era nations that might have been become Greece after the end of the Hyborian Age, since in ancient times, Greece was called Argos, and Corinth was the name of a Greek city. Would have been nice had they done a Hyborian Era story where we see the young Zeus being raised, but now that the rights to the Robert E. Howard characters are gone, such will not happen. Mitra, Asura, Ibis, and Ishtar must have been mad to see Zeus steal their worshippers, but, hey, that is life. Oh, since Prometheus probably was chained to the Caucasian Mountains at some point within a thousands years after 9,500 BC, and Hercules was not born until at least 1300 BC or so, that means that Prometheus spent at least 8000 years getting his liver pecked at by a vulture. The Gods are older than originally thought, and were around back then. Different incarnations/cycles of the gods, as we see with the Asgardians, and their cycle of Ragnarok and rebirth. Non-linear time in the realm of the gods, making their origins and actions seem to be occurring at multiple points in time. Or time travel to get their names known before they were even born. There are multiple examples of demons taking the names of past gods, and gods taking the names of past demons, so a reference to Zeus in the Hyborian era might not mean the Olympian God as he is known in the modern era. antecedent to Greece, but rather in the post-Hyborian land that later became Greece. As Will pointed out, the use of the term "Greece" only goes back to 1830. The main line that mislead me was the phrase "After the end of the Hyborian Age". However, in the original official handbook, the full sentence is After the end of the Hyborian Age, as the civilization of ancient Greece began to rise, Zeus decided to make the presence of the Olympian gods known to the Greeks so that they would worship them". So that was just intended to relate the rise of the civilization of ancient Greece as following the end of the Hyborian Age. About 500 years after this cataclysm that destroyed Atlantis, another disaster occurred that slightly further altered the world's landmasses. Finally, another cataclysm occurred around 8000 BC that ended the Hyborian Era. Since the beginning of the worship of Zeus and the Olympian gods is slotted as after the end of the Hyborian Age in Zeus' and the Olympian's Handbook entries above, their interaction with the human race would seem to mostly begin after the Hyborian Age. Inserting a flood into history then would be a bit problematic. -see above, regarding "after the Hyborian age"
Whether the biblical date of the flood and Noah fits into the Marvel Universe is unknown. The story of the ark has been placed with Utnapishtim, and as occurring @ 18000 BC. That's all we know for sure. Could there have been a 4th great flood? As Will U tells me, the biblical version of the flood has been placed, in real world history, @ 2940 BC, with Adam and Eve in the Garden of Eden about 4000 BC. That flood dates is almost verified by the story of Gilgamesh's reign in the Sumerian texts and the Five Invasions of Britain, one of which was by a grand-daughter of Noah. Does that have any significance in the MU? No Eye Deer. Prometheus is one of the few, if not the only, one of the Titans to have appeared in actual story. 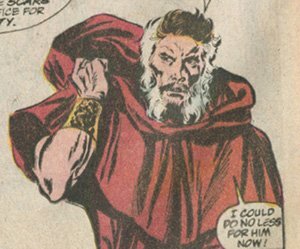 The others such as Cronus are only mentioned in the Handbook entries cited above, though in Marvel Classic Comics#18, Odysseus does mention seeing Cronus in Hades. DC has made much more use of the Titans. For the record, some of the other Titans are Hyperion, Crius, Oceanus, Coeus, Iapetus, Thea or Thia, Rhea, Mnemosyne, Phoebe, Tethys, and Themis. Menoetius is supposed to have appeared. Whether this was actually him or just a magical creation named for him isn't 100% certain. Atlas appeared in Journey into Mystery I#124 and was mentioned in a flashback in Thor II#7. Epimetheus, per the myths, later married the much despised Pandora. Pandora's box has been seen elsewhere on Earth-616. Hyperion's son, Helios, appeared in Marvel Classic Comics#18: The Odyssey. Odysseus mentioned seeing Cronus in Hades in that issue, too. I always wondered how Thor Annual#10 and The Official Handbook of the Marvel Universe Deluxe Edition#5, which state that Atum's (Demogorge's) having split himself up producing the subsequent races of gods fit in with Ouranos, Burri, and so forth. Since Ouranos has never actually been seen in a published story, only referred to in the Handbook, much remains to be clarified as to when he showed up. Happily, since Atum (Demogorge) is owned by Marvel, there remains a possibility of this happening. Prometheus should also not be confused with Tityus, who also had a vulture peck at his liver. All other characters mentioned or pictured are &trade; and 1941-2099 Marvel Characters, Inc. All Rights Reserved. If you like this stuff, you should check out the real thing!